I updated my list of Bollywood movies on Netflix with four new additions to the catalog. Well, four re-additions, actually. After a prolonged absence from the service, Besharam, Bodyguard, I, Me, aur Main, and Singham are back. Their return (sort of) offsets the recent expiration of Kill Dil, Shahid, and Shuddh Desi Romance. This entry was posted in Streaming Video and tagged Besharam, Bodyguard, Bollywood, Bollywood Movies on Netflix, Desi Movies on Netflix, Hindi, Hindi Movies on Netflix, I Me Aur Main, Indian, Indian Movies on Netflix, Movie, Netflix, Singham, Streaming Video on May 2, 2016 by Kathy. Ranbir Kapoor’s return to the big screen (not counting his cameo in PK) wasn’t the resounding success one would’ve hoped for. During its debut weekend of February 13-15, 2015, Kapoor’s Roy earned $165,203 from 83 theaters ($1,990 average) in the United States and Canada. Kapoor’s last major role was in 2013’s Besharam. That film was branded a total flop after earning just $504,000 from 217 theaters in North America. While Besharam‘s extravagant theater count magnified its degree of failure, it still averaged more per screen — $2,323 — than Roy. This entry was posted in Box Office and tagged 2015, Baby, Besharam, Bollywood, Bollywood Box Office, box office, Dolly Ki Doli, Earnings, February 13-15, Hindi, Indian, Movie, PK, Ranbir Kapoor, Roy, Shamitabh on February 18, 2015 by Kathy. Two lackluster comedies from 2013 were just added to Netflix. Akshay Kumar’s Boss unsuccessfully tries to marry gory violence with lighthearted comedy, and it doesn’t work. Ranbir Kapoor’s Besharam also fails by trying to make a hero out of a reckless criminal. For everything else new to streaming on Netflix, check out Instant Watcher. This entry was posted in Streaming Video and tagged Akshay Kumar, Besharam, Bollywood, Boss, Hindi, Indian, Movie, Netflix, Ranbir Kapoor, Streaming Video on August 13, 2014 by Kathy. Despite being lambasted by critics, Humshakals performed reasonably well in its first weekend in North American theaters. From June 20-22, 2014, Humshakals earned $262,502 from 165 theaters, a per-screen average of $1,591. That $262,502 gross isn’t exceptional, but it’s in keeping with the total earnings of several Hindi comedies released in 2013 in North America. Humshakals is likely to stick around for another week, so its total earnings will probably be closer to those of Besharam than Yamla Pagla Deewana 2. In 2013, a film only needed to earn upwards of $230,000 to finish in the top half of highest earning Hindi movies in the U.S. and Canada, so Humshakals is well-positioned to finish in the top half for 2014. However, Besharam was considered a box office flop relative to expectations, so matching its total is nothing to brag about. In one crucial regard, Humshakals already lags behind. Besharam opened in an overly ambitious 217 theaters in North America, and its first weekend per-screen average was $2,323. Humshakals — whose 165-theater opening was also too ambitious — only averaged $1,591. That’s a lower opening weekend average than director Sajid Khan’s last critically panned film: 2013’s Himmatwala, which averaged $1,998 on 99 screens in its first weekend before posting a final tally of $270,880. While Humshakals‘ earnings aren’t horrible, they’re not great. Its performance — like the performance of Besharam — highlights the importance of correctly judging demand for your product and booking the right number of theaters accordingly. One other Hindi movie opened in limited release in the U.S. on June 20, and its numbers are so bad that I can hardly believe they’re correct. Miss Lovely opened in three U.S. theaters, from which it earned just $558. Total. Despite a strong festival pedigree, its release wasn’t promoted in any meaningful way (unlike The Lunchbox), so potential moviegoers may not have known about it. Maybe Miss Lovely will have more success when it opens in Chicago and Austin this Friday. Source: Rentrak, via Bollywood Hungama. 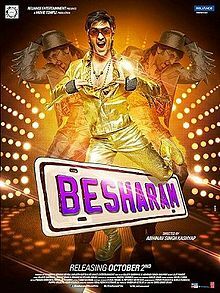 This entry was posted in Box Office and tagged 2014, Besharam, Bollywood, Bollywood Box Office, box office, Filmistaan, Heropanti, Hindi, Holiday, Humshakals, Indian, June 20-22, Miss Lovely, Movie, Sajid Khan, The Lunchbox, Yamla Pagla Deewana 2 on June 24, 2014 by Kathy. The relatively low-budget biographical drama Shahid opens in Chicago area theaters on October 18, 2013. This is something of a surprise given that Akshay Kumar’s Boss just released on the 16th. But considering that I was the only person in a 592-capacity theater for yesterday’s first showing of Boss, this is probably a good move by the makers of Shahid. Shahid opens on Friday at the Big Cinemas Golf Glen 5 in Niles and AMC South Barrington 30 in South Barrington. (Update: For my fellow non-Hindi speakers, the print at the South Barrington 30 cuts off the English subtitles at the bottom of the screen. Looks like I’ll have to wait for Shahid on DVD.) It has a listed runtime of 1 hr. 45 min. After opening Wednesday, Boss gets its first full weekend at both of the above theaters, plus the Regal Cantera Stadium 17 in Warrenville. The only theater giving a third week to Besharam is the South Barrington 30. Ouch. Other Indian movies showing in the Chicago area this weekend include Singaravelan (Malayalam), Vanakkam Chennai (Tamil), and Pakistan’s submission to this year’s Oscars, Zinda Bhaag (Punjabi), at the Golf Glen 5; Atharintiki Daaredi (Telugu) and Ramayya Vasthavayya (Telugu) at both the Cinemark Century Stratford Square in Bloomingdale and Cinemark at Seven Bridges in Woodridge; and Doosukeltha (Telugu) at the Muvico Rosemont 18 in Rosemont, which is also carrying Ramayya Vasthavayya. This entry was posted in Weekly Theater Updates and tagged 2013, AMC South Barrington 30, Atharintiki Daaredi, Besharam, Big Cinemas Golf Glen 5, Bloomingdale, Bollywood, Boss, Chicago, Cinemark at Seven Bridges, Cinemark Century Stratford Square, Doosukeltha, Friday, Hindi, Indian, Malayalam, Movie, Muvico Rosemont 18, Niles, October 18, Punjabi, Ramayya Vastavayya, Regal Cantera Stadium 17, Rosemont, Runtime, Shahid, Singaravelan, South Barrington, Subtitles, Tamil, Telugu, Trailer, Vanakkan Chennai, Warrenville, Woodridge, Zinda Bhaag on October 17, 2013 by Kathy. For better or worse, Besharam is the main game in town for the foreseeable future. For the weekend beginning Friday, October 4, 2013, Besharam continues its run at all seven of the Chicago area theaters in which it opened on Wednesday. The only other Hindi movie playing locally is the surprisingly funny Phata Poster Nikla Hero, which has earned $390,207 in the U.S. so far. It gets a third week at the Big Cinemas Golf Glen 5 in Niles, AMC South Barrington 30 in South Barrington, and Regal Cantera Stadium 17 in Warrenville. Sadly, Warning gets tossed overboard after just one week. With upcoming star-studded films timing there releases around major holidays in India (and trying to avoid competing with one another), we’ve likely entered a cycle in the Chicago area in which only one new Hindi movie will open theatrically every other week, as opposed the usual schedule of at least one new movie per week. Apart from a brief flurry of big-time releases in mid-November, the intervening weeks are peppered with the releases of low-budget films from smaller studios featuring no major stars. Those movies may get sizable releases in India, but they aren’t likely to command screenspace in U.S. theaters. This entry was posted in Weekly Theater Updates and tagged 2013, AMC South Barrington 30, Besharam, Big Cinemas Golf Glen 5, Bollywood, Boss, Bullett Raja, Chicago, Dhoom 3, Earnings, Friday, Gori Tere Pyaar Mein, Hindi, Indian, Krrish 3, Movie, Niles, Phata Poster Nikla Hero, R... Rajkumar, Ram-Leela, Regal Cantera Stadium 17, South Barrington, Warning, Warrenville on October 3, 2013 by Kathy. Besharam (“Shameless”) was likely sold to investors using the following equation: Ranbir Kapoor + antics = super hit. The equation will probably prove correct, but that doesn’t mean that Besharam is a great movie. Writer-director Abhinav Kashyap is so confident in Ranbir’s ability to charm audiences that he offers only the barest hint of a plot. The movie starts with a brutal scene of a gang led by Bheem Singh Chandel (Javed Jaffrey) blowing up a police van with a rocket launcher and siccing an attack dog on an officer. The gangsters disappear for forty-five minutes, until they hire Babli (Ranbir) to steal a car for them. In the interim, we get to know Babli, a mechanic who supplements his income by fencing stolen automobiles with the help of his best friend, T2 (Amitosh Nagpal). Their profits fund the orphanage where they grew up and still reside as adults. The head of the orphanage, Masterji, knows that Babli and T2 are crooks, but he takes the money anyway, while expressing hopes that the younger boys will grow up to find legitimate jobs. Babli meets a beautiful woman, Tara (Pallavi Sharda), who’s unimpressed with his sleazy come-ons. Spurred by the challenge, Babli pursues Tara, only to inadvertently steal her new Mercedes on Chandel’s behalf. Having hurt Tara, Babli finally discovers that other people are affected negatively by his actions. From this point in the story, most movies would focus on Babli’s character development as he reforms his ways to impress the girl and right the wrongs he’s committed. Kashyap takes the opposite tactic. Babli is made into a hero, with everyone — including Tara — apologizing to him for having judged him too harshly and vowing to emulate his shameless ways. This story turn just doesn’t work. Babli, through his self-centered carelessness, not only steals from Tara, he endangers the lives of everyone he cares about, including all the kids at the orphanage. Masterji, T2, and their friend, Bhura, are beaten and kidnapped because of Babli, yet no one is upset with him. Kashyap tries to blame Babli’s flaws on classism. Tara is set up as an elitist who’s only interested in money and status and who looks down on a mechanic like Babli. First of all, why shouldn’t she be allowed to marry a peer who (like her) has a high-status job? Second, and more importantly: BABLI STOLE HER FRIGGING CAR! Babli’s orphan status is used to shoehorn Ranbir’s real-life parents, Rishi Kapoor and Neetu Singh, into the movie as a pair of married police officers. As soon as they mention that they never had children, it’s obvious that Babli won’t be an orphan by movie’s end. For what it’s worth, Ranbir is really darned charming. His charisma is the only thing that makes the movie watchable. Ranbir is at his best in scenes with Nagpal, as the friendship between Babli and T2 is the movie’s strongest relationship. What I’ve always enjoyed about Ranbir is his ability to shine in a variety of roles, but Besharam may mark the start of Ranbir Kapoor: The Franchise. I fear that Ranbir has earned so much industry clout that he’ll be pigeonholed into “charming” roles, playing the role of Ranbir much in the way superstars like Salman Khan, Shahrukh Khan, and Akshay Kumar seem to play the same type of character in every movie. It’s a trap that can be avoided, but only if he’s careful. This entry was posted in Reviews and tagged 2 Stars, 2013, Abhinav Kashyap, Amitosh Nagpal, Besharam, Bollywood, Hindi, Indian, Javed Jaffrey, Movie Review, Neetu Singh, Pallavi Sharda, Ranbir Kapoor, Rishi Kapoor, Shameless on October 2, 2013 by Kathy.